Star Wars Celebration Collecting Track Schedule Released! For those attending Celebration Orlando, the Collecting Track has released its full schedule of events! There are a lot of awesome panels this time around, being presented by a lot of familiar faces to regular readers of our blog and/or listeners to the 'Chive Cast. So, be sure to check them out! While it may seem late to say that (unless you celebrate Chinese New Year), this is my first one of the year being the lazy collector I’ve become. It is St. Patrick's Day, though. Nevertheless, I’ve found a few great pieces to talk about to start off the year. From first shots to 3-packs, there has been a lot of fun movement in the market this year. Overall this is pretty typical for the post-holiday season. It seems that Vintage has moved away from the month of December and now has January and February as its high points for the winter months. And if you think it through, it makes perfect sense. Everyone is time constrained by the holidays. Even if you don’t celebrate any holidays in December, you’re still caught up in everyone else's holiday stuff in some way. This leads to less time to buy and list, leading to fewer available pieces in the market. Money is money and if you’re anything like my family, December is one of the most expensive months of the year. This then leads to less spending in December and more purging in January. Tax season – most collectors are still of the working age and each year a large percentage of collectors get there tax return check in February or even early March. Given these factors, it's easy to see why the 1st quarter of the New Year has become a great season for Vintage toys. For those of you following the blog for a long time, you know that I can never resist to post the sales of Vintage 3-packs. I have a bit of a soft spot for this segment of the line. This series is one of the most aesthetically pleasing and well-designed in the hobby. 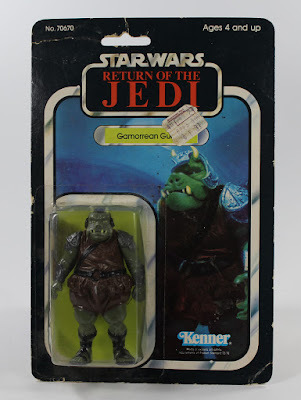 The colors, the figure combinations, the use of true bubble on the package all melds together to bring out everything that was great about the Kenner line. Throw in a dash of rarity and you have yourselves one hell of a cool product. 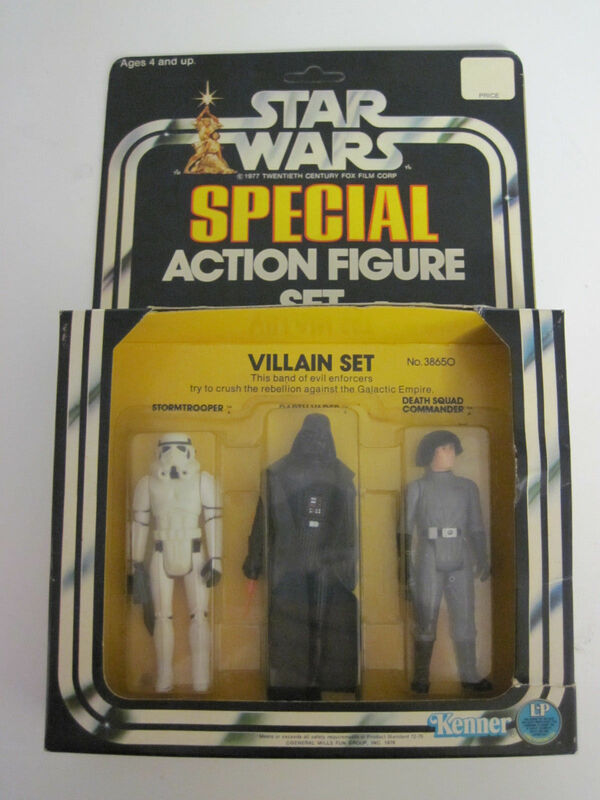 This month we have an example of the "Villains" 3-pack, although the set should have been more appropriately named the "Empire" set. 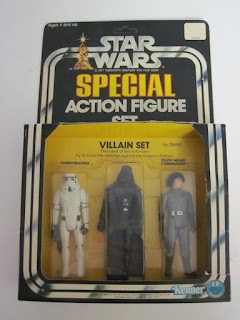 Featuring a Stormtrooper, Death Squad Commander and Darth Vader himself, this particular 3-pack has always been popular with collectors, and because of that it can fetch a hefty price. In this case we have an ungraded but sealed example in C8 condition. The price of $5,300 is spot on for a set in this condition, almost bordering on cheap. The winner should be very happy with the results. Store displays have been on fire for the last few years. Thankfully I’m not speaking in literal terms, but you get the idea. The store display segment of the hobby has become so popular that last year we spent an entire update covering an entire array of great items coming up on the market. 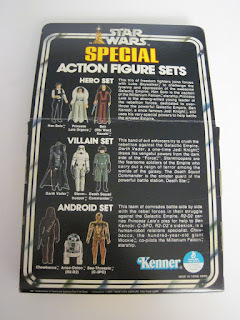 With challenges of not being able to keep up with demand for the action figures, Kenner ramped up production not only on toys themselves, but also the quantity of point-of-purchase displays produced during the Star Wars era. Many large display headers, bells and other P.O.P. were never even used in actual stores, and stacks made their way into the hands anxious collectors as well the attics and basements of old shop owners. Thus, the vast majority of store displays that have survived until today come from this era. 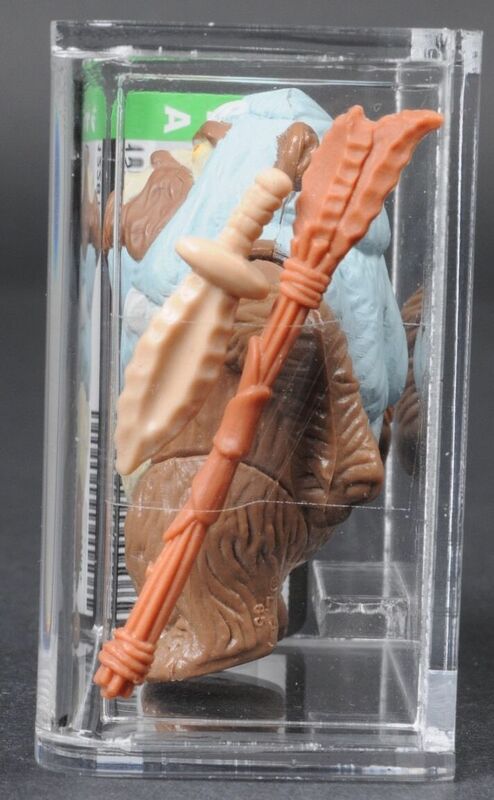 The example we have here isn't one of most common displays from the Vintage Star Wars line: This Version of a 21 Figure Header display is one of the last released and more rare of the 21 Figure Headers. This is a great piece overall, and in great condition. Given that, the price seems right on one of this caliber. Personally, I’ve always loved cardback artwork and I think one of the best things about this particular display is that it borrows from the movie images much like the cardback artwork for the line and that makes it unique unto itself in the category of store displays. Additionally, it’s the First 21 -- the vast majority of everyone’s favorite characters. 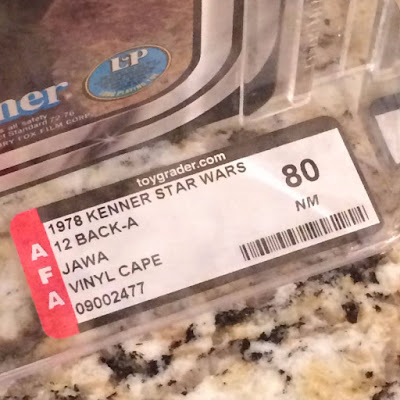 Rounding the corner home this month we have a staple of the hobby: a MOC Vinyl Cape Jawa. Often looked at as one of the most sought after “rare” production pieces in the hobby, the VCJ will always bring attention, even loose. This piece caught my attention given its small price tag (which was driven by the fact that the cape itself is discolored), but also by the fact that it was listed as a BIN with a reasonable price. With examples selling for north of $10K consistently, this was a really nice grab for someone who wants something nice, but not perfect. 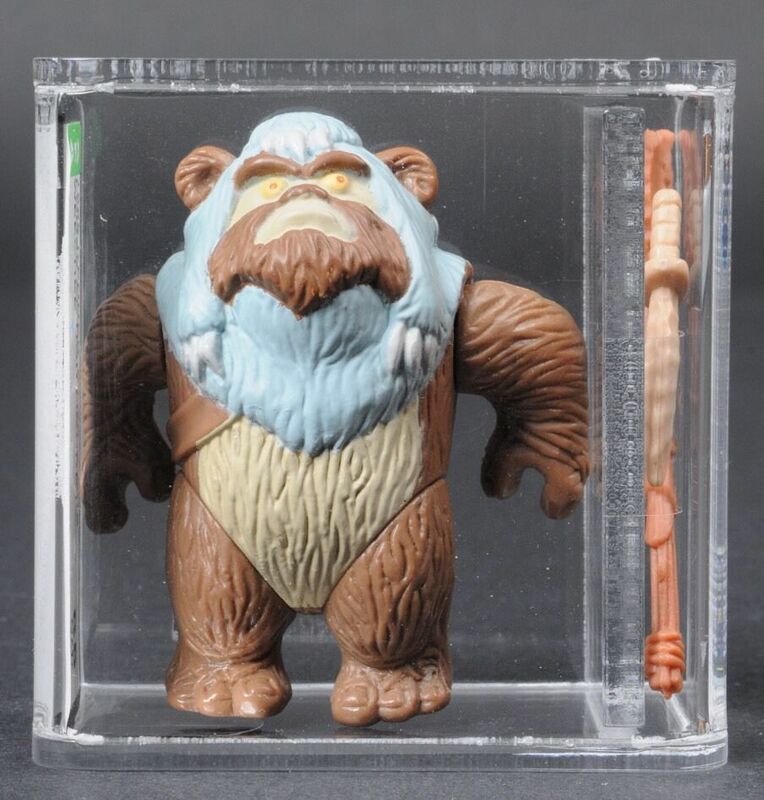 Finishing off this month’s update we have two pieces from the unproduced Ewoks and Droids cartoon toy series. Considered by many to be one of the greatest toy lines never to reach the shelf, the 2nd Series Droids and Ewoks figures have become something of legend in the hobby. Prices over the years have continued to soar on these pieces and it’s not difficult to see why. The detailing and representation of these characters from 2D to 3D is one of the most accurate representations of all time. 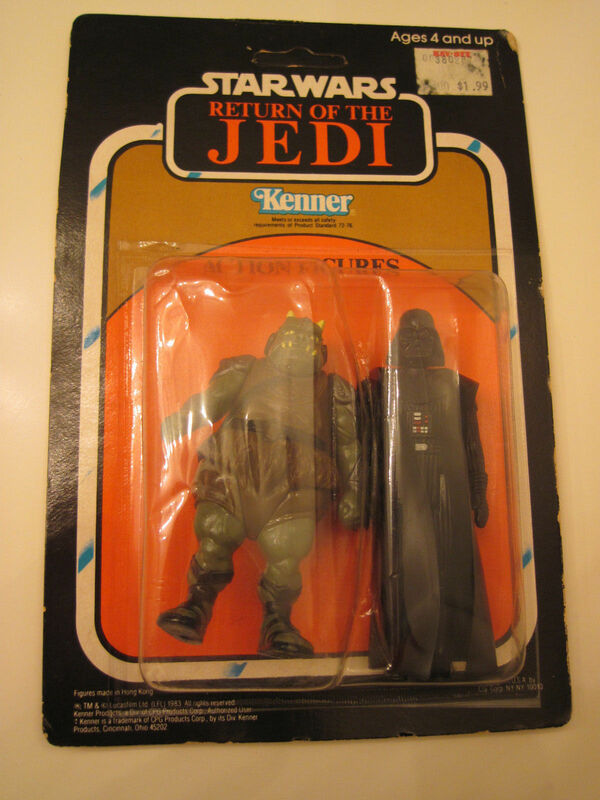 Driving this is the improved product design and detail that Kenner was able to produce in their later Star Wars lines such as Power Of The Force. However, a lot of credit has to be given to the animators of the series as a whole, as these toys were ultimately representations of their creations. 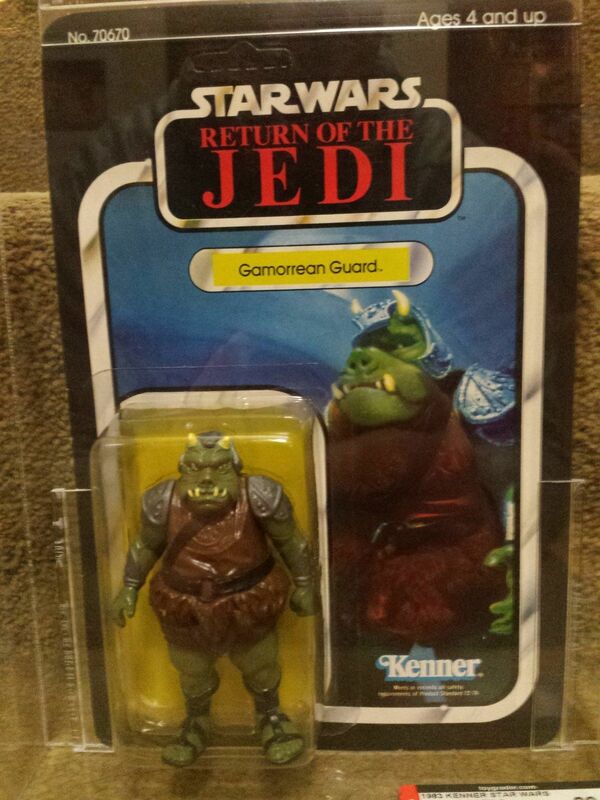 That lead to some very distinctive characters that were unlike any other cartoon or toy line at the time. Many of us know the story of why the line never hit stores, so I won’t re-hash that here. But if you would like to learn more about this line please visit the Ewoks and Droids Prototypes Archive Database section for details on the series. The first figure that we have is Weechee -- one of our furry friends from the Ewoks line. 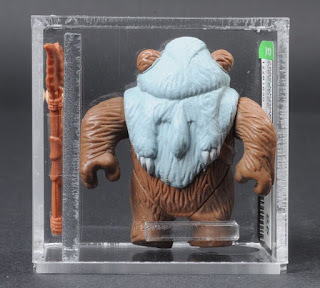 Weechee is one of the more coveted of the characters in the unproduced wave of Ewoks figures. 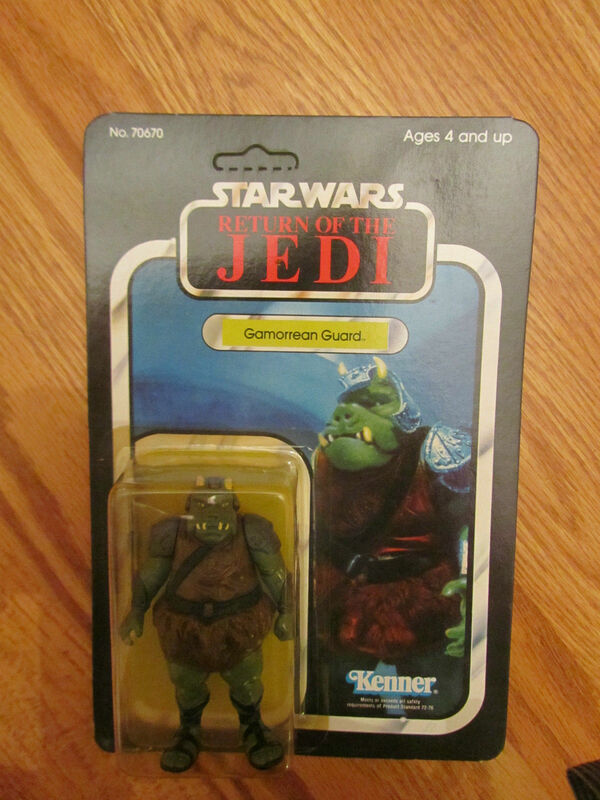 Unlike Paploo or Chief Chirpa, he wasn’t part of the original theatrical release of Star Wars toys based on the Ewoks in Return of the Jedi. The color scheme used and the detailing of the prototype blend together well to create a different and exclusive character for the series. Although we don’t know the final sale price. In addition to our furball Weechee, we had another amazing and rare piece come up this month in the form of Vlix from the Droids series. 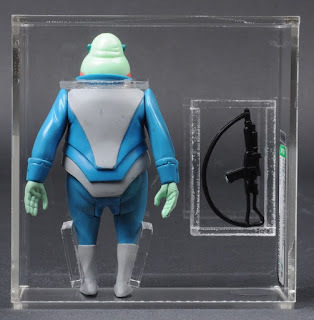 Unlike all of the other characters in the 2nd series of the Droids figures, Vlix was actually released -- but on a very small scale by Glasslite in Brazil. Because of the location and small production quantities, only a finite amount of Vlix production figures still exist today and can be seen on the market for anywhere from $3,000 in poor condition with no weapon, to $7,500 for a great example with its weapon. The example we are presented with, however, is not Glasslite and not production. Like Weechee above, we have a first shot prototype of Vlix from the Vintage Kenner line. 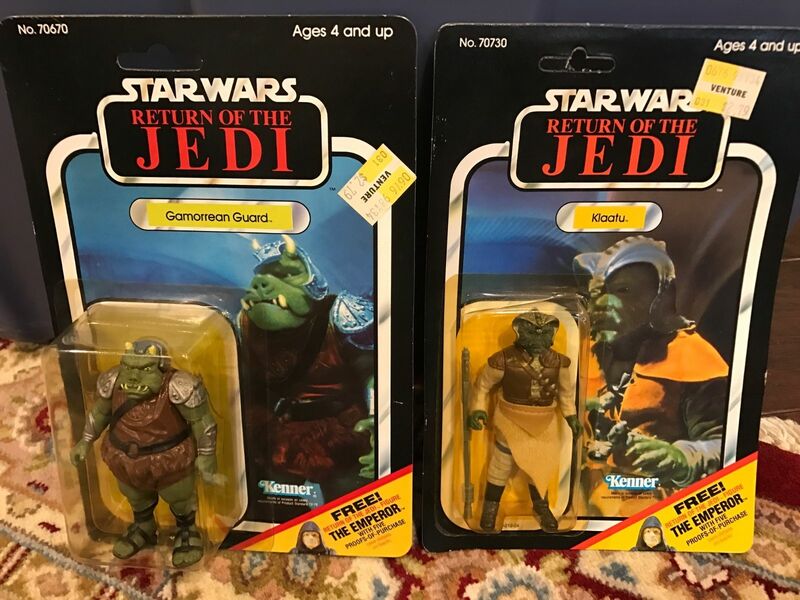 With that, the game changes drastically -- in this case selling for an estimated value double that of the Glasslite production pieces that have recently traded, and even significantly up from the other first shot figures from this line. That’s it for this month, see you at Celebration Orlando! Last year Kevin Lentz contributed to this blog a nice survey of Star Wars-related read-along material. If you haven't already, check it out here. He now returns with a look at carrying cases devoted to audio media. Have you ever wanted to tote a record or take along a tape? If so, Kevin's got you covered. Kids today are so used to streaming music that even the concept of loading MP3s onto an iPod is old fashioned to them. They're accustomed to easy access to their audio, wherever and whenever, as long as they remembered to charge their phones. It wasn't so easy for us in the 70s and 80s to carry our music around. First, of course, you had to have an actual media player (a Walkman, a boombox, or a suitcase-style record player). Further, and more importantly, you also needed something snazzy in which to carry your actual media. 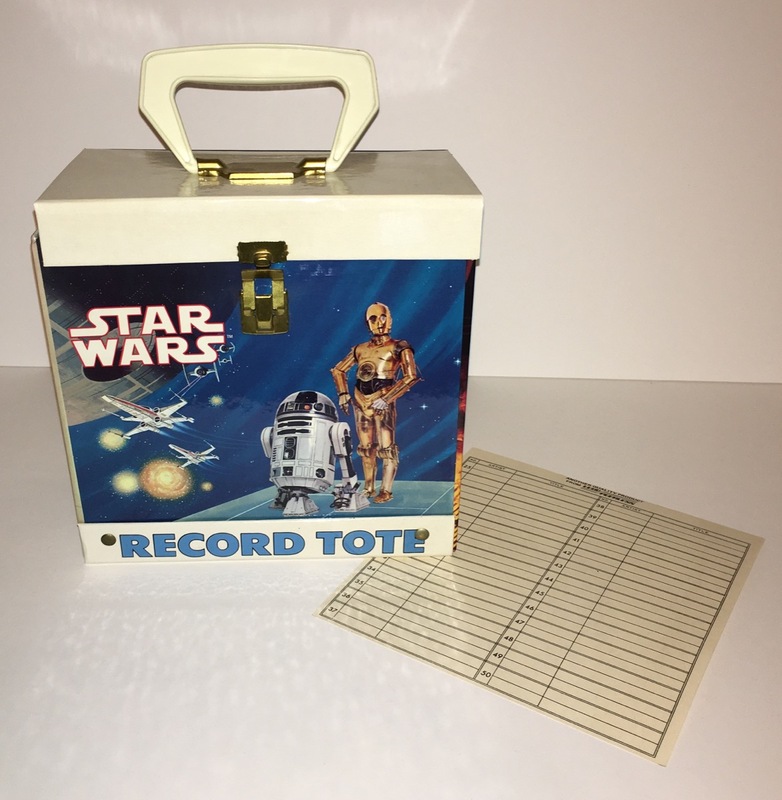 The earliest Star Wars brand media transport was the Buena Vista Record Tote. 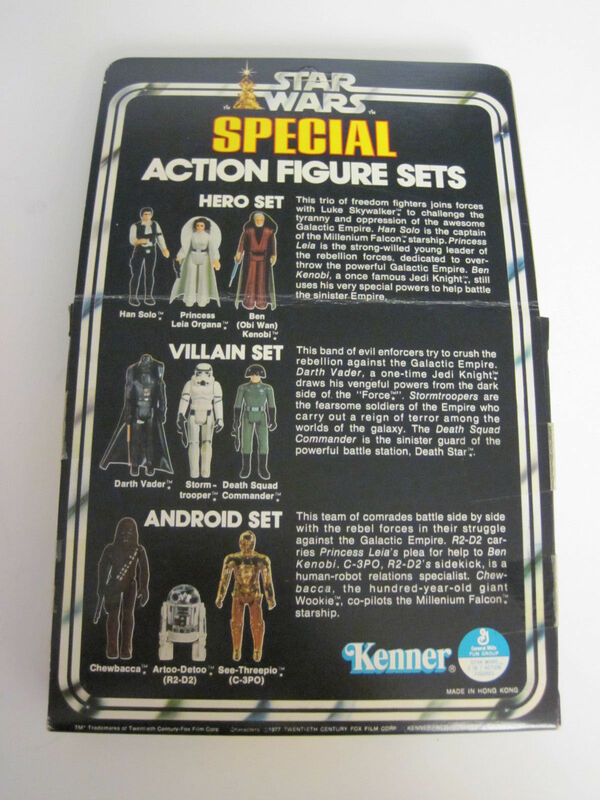 While the front of the box features the cover to the Star Wars read-along, it's actually from 1982. 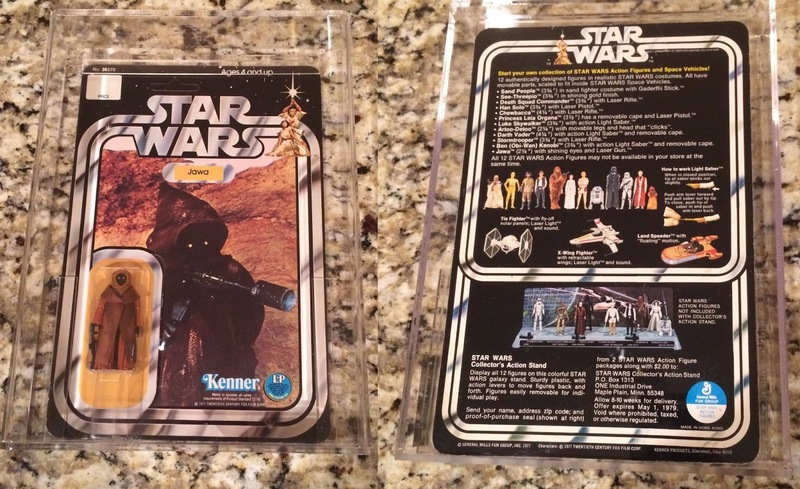 The side and back panels feature photo stills from The Empire Strikes Back. 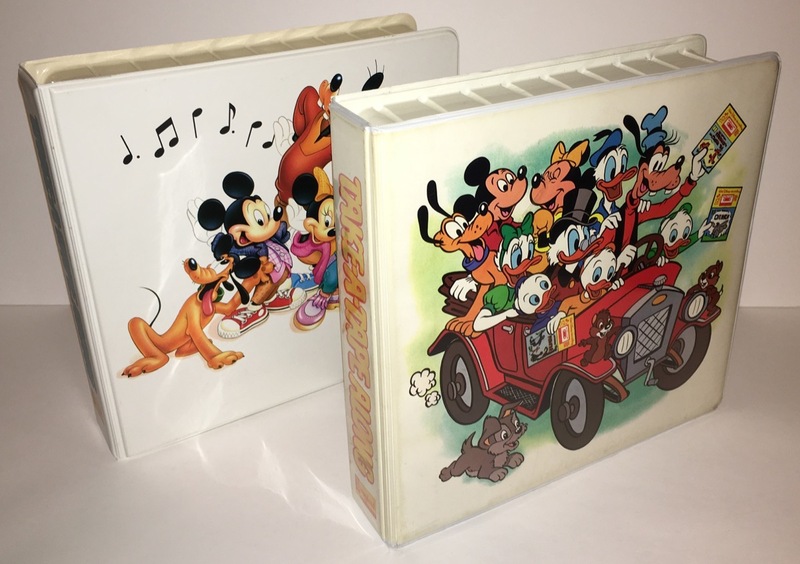 The Tote came with an insert for listing records, and the case uses a design previously released with Mickey Mouse Disco art. 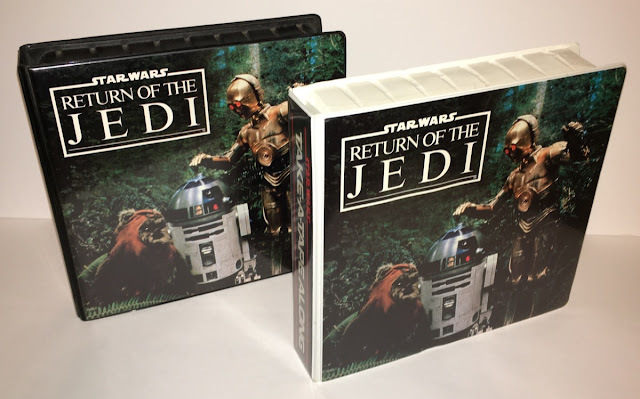 The 1983 Return of the Jedi Take-a-Tape Along (TATA) case also featured new art on an existing case (the 1979 predecessor featuring Mickey and the gang riding in a jalopy, waving their unopened read along sets in the wind). The TATA set holds six cassettes on the left and has an insert on the right that holds 12 read-along books. In fact, Buena Vista sold the TATA set with tapes and books included. As I remember, they were sold through school book fairs, but may have been available elsewhere. 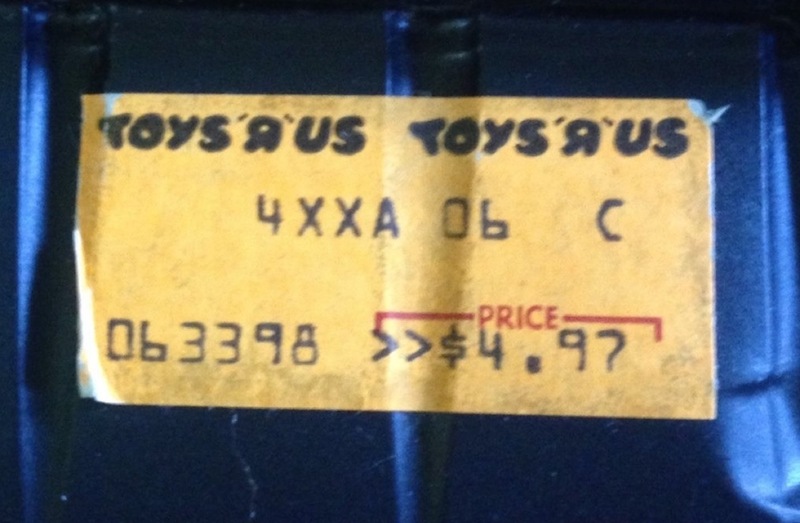 The case itself was also sold in stores, as evidenced by this Toys 'R' Us price sticker (image provided by Amy Sjoberg). The white Return of the Jedi TATA case is from Canada; the black one is from the U.S. 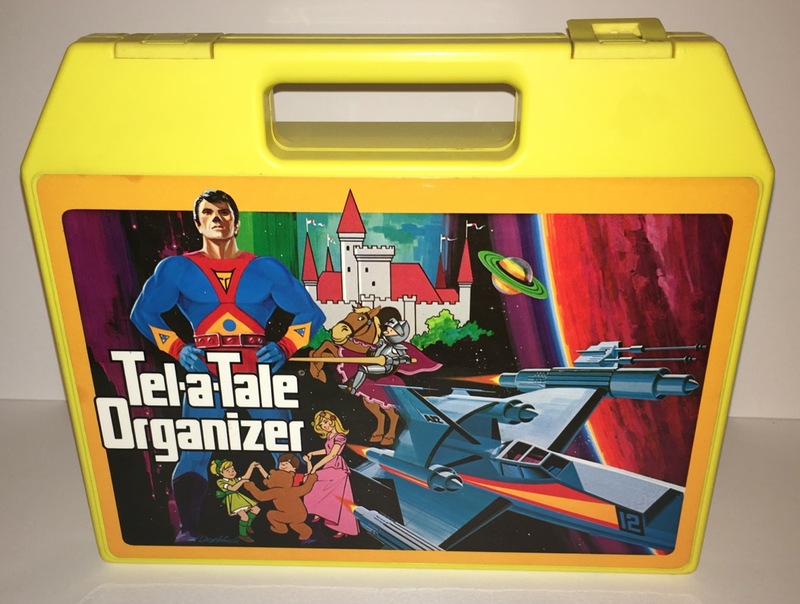 Honorable mention goes to the knockoff Tell-a-Tale Organizer because it's made of much sturdier plastic than the TATA case and holds more media. The ship is more Buck Rogers than Star Wars, but maybe that's an Ewok wanna-be dancing with the princess beneath Superdude's crotch? 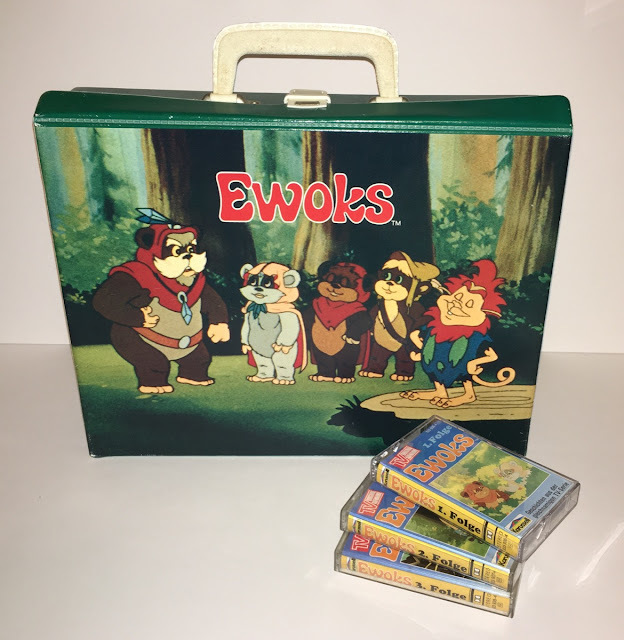 Speaking of Ewoks, here's a cool 1987 cassette case from Karussell, the German company that produced the three Ewok cartoon hörspiele, which are basically radio drama-style audio stories that remain popular with children and adults in Germany today. 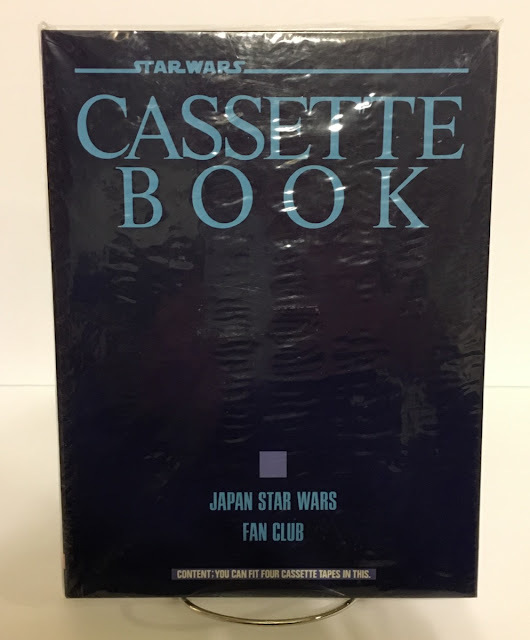 Less visually interesting, but pretty scarce, is this 1986 Cassette Book, which was available through the Japan Star Wars Club. As we moved into the CD era, we got numerous CD wallet options. I don't know much about them - CDs are a bit too newfangled for my collecting habits, but I wanted to give them a shout out here regardless. Thanks to Duncan Jenkins for the images. Today, all you need is a phone and a signal, and you can access pretty much any media you want. 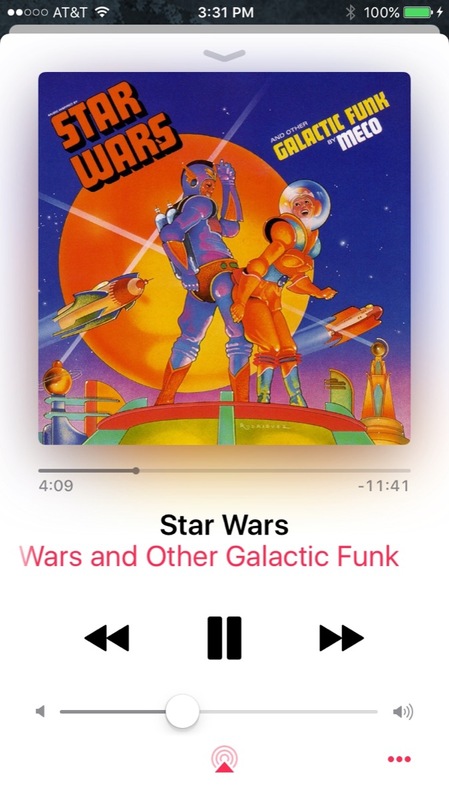 I'll grant, there's a niceness to the convenience of easy access to Galactic Funk whenever I'm feeling it. Three clicks on your phone don't have the same tactile satisfaction, though, of filling up your Record Tote or Take-a-Tape Along case with your favorite stories and packing them over to your friend's house for a sleepover. For those of you who follow the MarketWatch "Figures of the Month," you'll certainly see the pattern. There are almost always some nice examples (often graded) that command a good price. 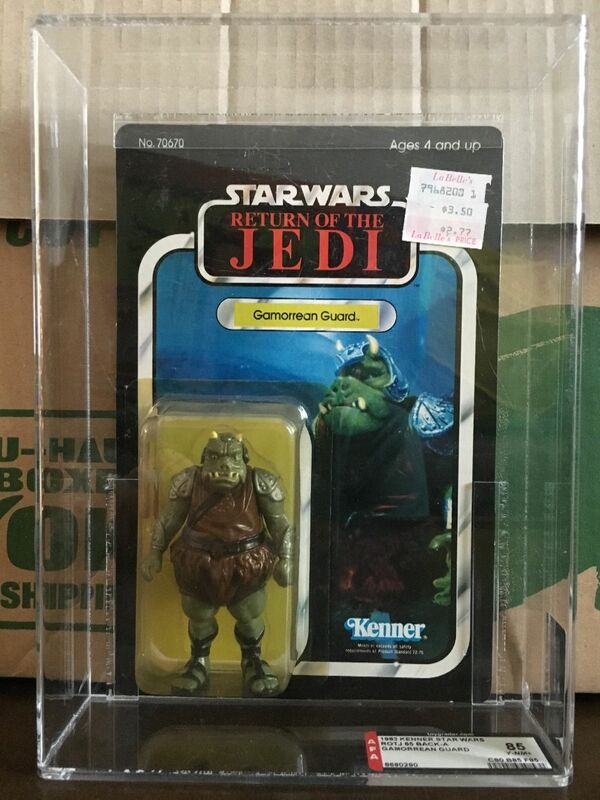 And we saw this with this month's figure, Gamorrean Guard, though at around $300 for a nice graded (clear bubble) the pricing wasn't too outrageous (though I appreciate this will depend on when you started collecting). 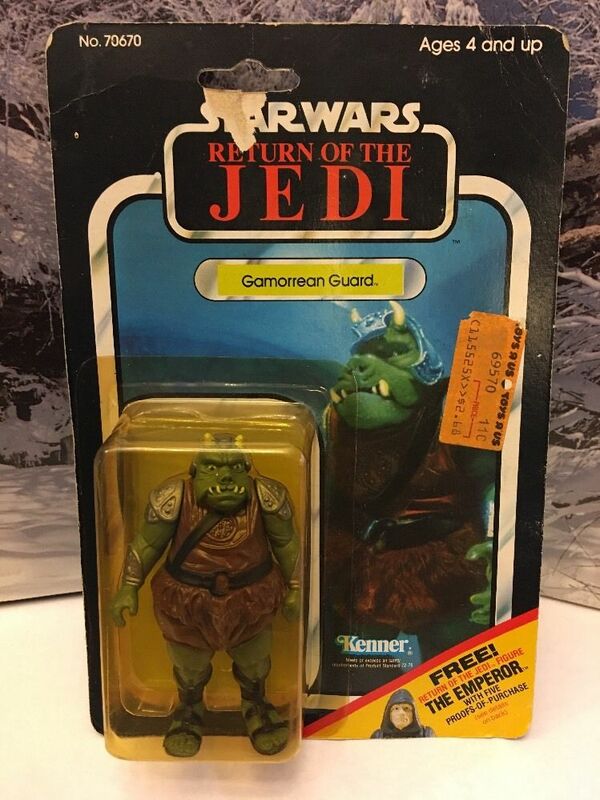 I would say that you could get a reasonable GG for around $50, though you might have to put up with a missing POP -- which I imagine will become more and more prevalent as we continue through the ROTJ line, as I'm sure by 1983/84 there were many collectors out there buying these and putting them away to fund their child's college fees. For those that collect the POTF line, they'll know GG is in the hard-to-get realm, with his release limited to Australia. I was able to find an example that sold for well over the $1k mark -- that's dedicated if you're doing a POTF and/or full carded run. Here's the data for the month...oh, and don't forget we now call him Crunchee! There ends another month. 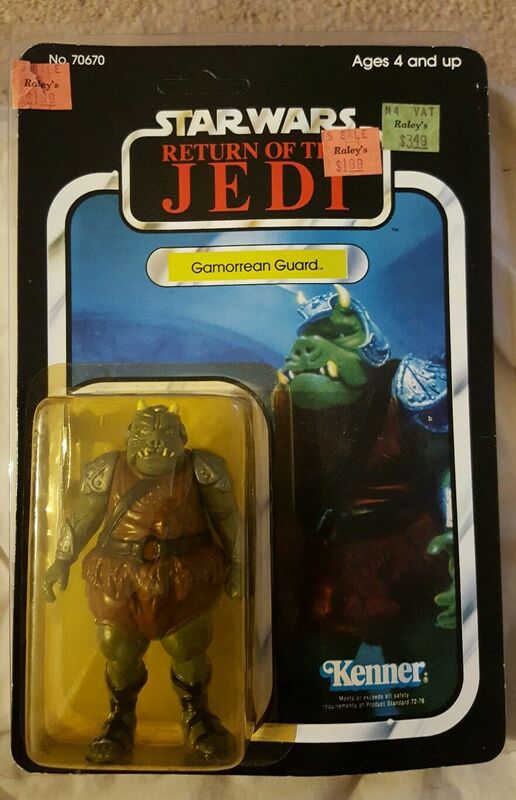 I will say he was an ugly figure, but had some nice playability with that axe weapon and you never had to endlessly re-stand this figure up -- he is solid. Welcome to our newest Collector Limelight entry -- one of many firsts. Not only is it the first limelight of the New Year, it’s also the first (but not the last) two-part limelight featuring one of the most spectacular Vintage Star Wars collections ever assembled. The last "first" could be the most important of the group, being this is the only entry to date where I was able to visit the collector and see the collection first-hand while conducting the interview. This gave me an exclusive perspective on the layout and overall depth of where our featured collector has gone with his collection. To say the least, it was an incredible experience and ranks as one of my favorites in over a decade of collecting Vintage Star Wars. Our collector for this limelight is Tim Eckholdt -- a collector focusing on pre-production items from the Vintage Star Wars line, with a specific yet vast focus on the first 21 characters. As most collectors do, Tim has veered into other segments of the hobby but kept a general focus on pre-production items through his journey. 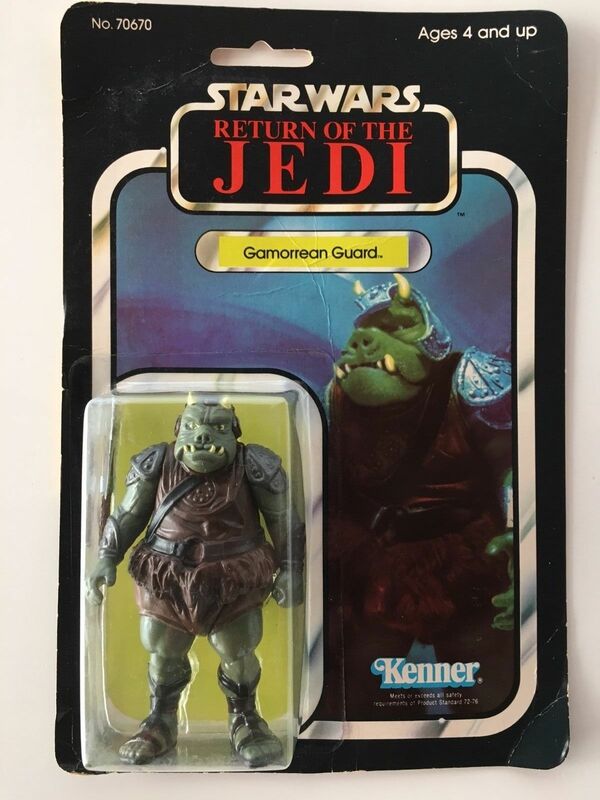 Tim’s collection is something of legend, with a room featuring some of the most sought after, desirable, and overall unique items from the Vintage Star Wars toy line. Tim is a collector of many years as well. He got his start in the hobby at a young age but puts 2005 as the watershed year when he started to focus more on the hobby and his collection. 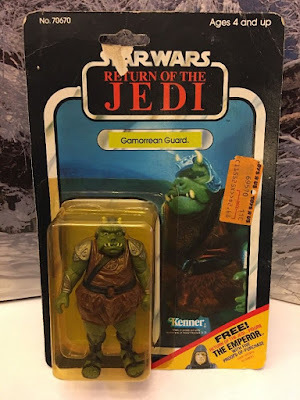 This was a time when a lot of new collectors entered the market and those that had been longtime collectors started to become more serious about the hobby as well. The depth and breadth of the collection are the two main reason we are covering it with two interviews. The extent of completeness is remarkable and the dedication and time that Tim has invested into the hobby is admirable. Our first part will focus in on two-dimensional items, and it’s sad to say we won’t be able to touch on everything in this sprawling collection, but will try to give you tidbits of some of the finer points. Like many collectors, Tim has a focus. But unlike most, it’s not on one figure; it’s not even on two, three or even twelve figures. 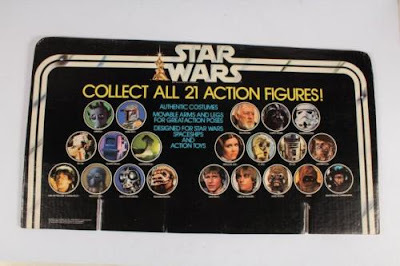 Tim’s focus is simply on the first 21 figures in the Vintage Star Wars toy line. This gives him more runway than single character focus collectors. The focus is so expansive that one could spend a lifetime pulling together items and never getting bored, and maybe that’s one of the key things that makes this one of my favorite collections in the hobby. There literally is no end... it’s a focus, it’s finite, but infinite at the same time. It’s a strange paradox, but beautiful. As a collector, Tim has shied away from production items over the years and focuses solely on things not sold in stores. It’s because of this that Tim’s collection is a standout -- literally every piece that you find has the potential to make you gasp, smile and just take a step back...but be careful what’s behind you, as it's more than likely as incredible as what lies in front of you. The collection as a whole is broken into a few categories that we’ll focus on. The main point of discussion and focus are the proofs and Cromalins for the first 21 characters. We’ll take a look at some great packaging artwork, large scale proofs, and finish it up with a few pieces that land far away from the first 21. As usual, because of time and other factors I rarely get to make it out to meet up with other collectors. Sure there’s Celebration, there are toy shows, but actually getting into another collector's home and spending time with them and their collection only happens a few times a year. For my visit, Tim pulled together several members of the Arizona Collecting Club, including Don Henderson, Andrew Davis and Paul Kotanske -- all of whom showed the patience of saints as it took me quite a while to pull myself away from the event I was attending in AZ. Arriving at Tim’s house was something in and of itself. As much as Tim is a collector, he’s a nostalgic individual as well. With a kitchen decorated in black and white tile and a 1960s style soda fountain, I might as well have been Marty McFly as I literally stepped back in time into a perfect representation of a 1960s diner. Tim’s collecting room was all that I thought it would be and much, much more. The rows of glass cases containing lines of proofs cards from every banner in the Vintage line were simply one of the most impressive an astounding sights I’ve ever seen in my years of collecting. FP: I know that you’re a collector at heart. Tell me a little bit about Tim Eckholdt the collector. TE: I’ve been collecting since 2005 pretty hard, on and off since I was a teenager on a few different fronts. I had runs with GI Joe, comics, and then came back to Star Wars. In comics I focused on Golden Age DC and all of the big books -- Action Comics 1 (1st Superman), 1st Batman, 1st Appearance of Robin, a lot of the inbetween issues of Detective Comics. FP: What was you earliest memories of Star Wars? TE: I remember going to Venture when I was a child. First figure was Luke Bespin, my sister got Leia Bespin. Earliest movie memory was going to see The Empire Strikes Back. I saw it before Star Wars, and saw Star Wars a few weeks later on cable. I saw the re-released Star Wars between Empire Strikes Back and Return of the Jedi. The movie made me jump into the toys. I can remember that Christmas and getting a lot of the playsets and vehicles. 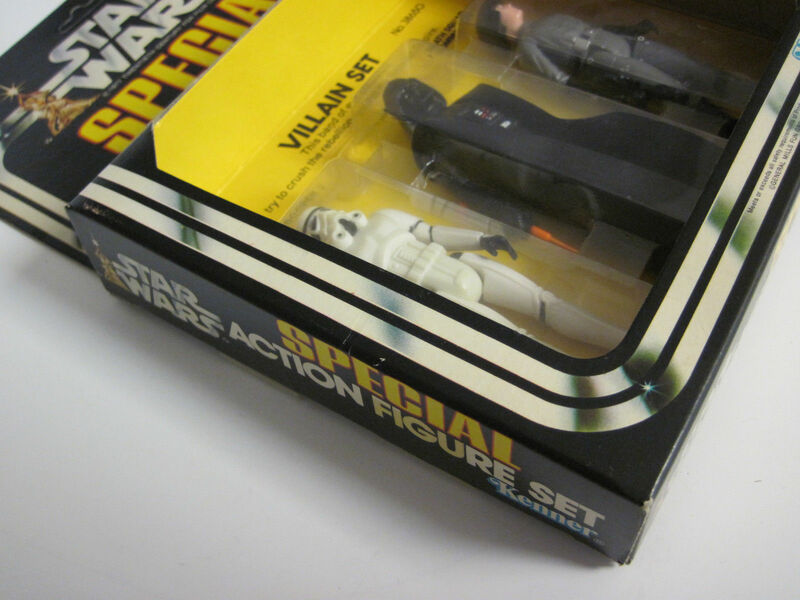 That first year I was opening the toys, but I didn’t get the Falcon. My uncle asked if I got everything I wanted and I said "no," and they had the Falcon hidden in the corner. It was a good memory. There was a lot of role playing as a kid, and interaction with other kids. Looking back, I think that the movie impacted me a lot more even into my adult years than I really thought it would. My engineering work is focused on aerospace and the grand ideas of Star Wars helped direct me towards a lot of these ideas. FP: Was Vintage Star Wars your first collecting hobby? TE: I went from comics to Star Wars. I was aware of Star Wars always being present in the world of comics, with crossover at the [collectibles] shows. At one point I bought a 200 figure collection during one of the shows in the 1990s. Some of the shows where I was selling comics, I would trade for Star Wars and pick up things like a Cloud City playset. FP: So your Vintage collection started with a few pieces here and there when collecting comics. When did you start to really focus in on Star Wars? TE: In 2005 I was collecting production pieces. I had a large carded collection as we had settled into our permanent residence and we had room. It evolved because I realized that no matter what amount of space you have, you can fill it up with production figures fairly easily. I decided to get into just Star Wars characters to try and focus in on a segment. Joe Yglesias had a 20 Back Luke Proof Card; I thought it would be fun to offset some of the production items I had. When it arrived it changed the way I looked at the collection. I learned about the 2D process and really got involved in 2D -- this occurred around 2008. I sold off the production collection and used the funds to start the focus on 2D. FP: How difficult was it to find stuff in 2008? TE: The goal was to get complete runs for each of the first 21, but I didn't expect to get there. 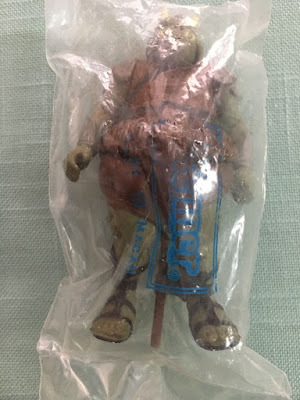 It was fortunate for me personally, because there were a lot of collectors that were letting go of pieces at the time the McWilliams deal happened. The economy had turned and it had a profound effect on the hobby, and because of this there was a lot available. The hobby was in a bit of turmoil, but I was in a good position professionally, and I still had funds from selling the production stuff. So I was able to jump in at that time, and because there was a large amount of items I was able to get more than I would have under a normal situation. FP: What was your sweet spot in finding stuff? TE: Rebelscum played a large part in it, and a few collectors that took me under my wing. Broc Walker was one person that really helped me. He helped direct me towards where certain items were and when they might become available. But overall it was Rebelscum. Some of the more common stuff came from eBay -- Revenge proofs for example. A lot of it was people trying to help me out. As I networked and met more people, others became aware of what was going on and I got access to a few things that weren’t available before they went up on the market. Most of the 2D came from a guy named Seth who was an unknown collector. A lot of his collection came from dealers like Tom Derby. 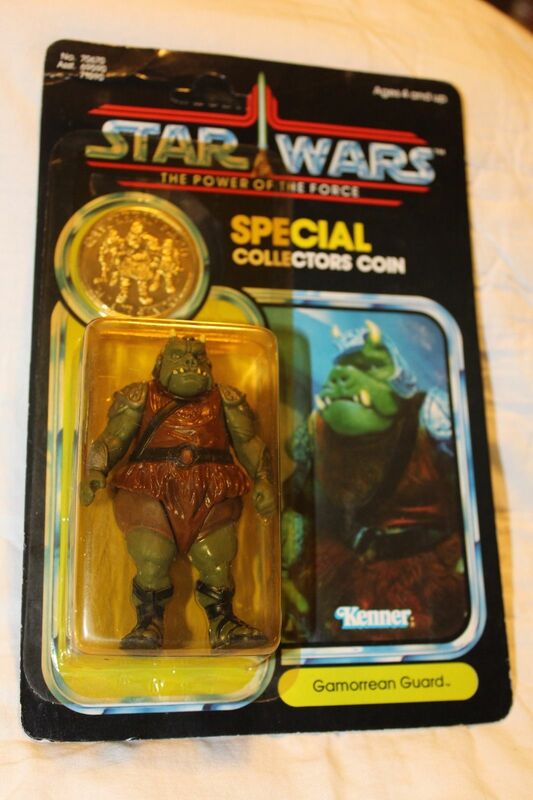 Very few people knew of him and I got wind of the collection and the fact that he was selling. Seth got out because he was getting bored. At one point he said he only got 12 things one year. He never really networked and made friends through the hobby. FP: What would you consider the grail piece in your collection? TE: The photo art spread for the 1981 Toy Fair catalog -- it’s the 48 figures against a red background. There was a lot of airbrushing to them. It makes me appreciate the craftsmanship and effort that went into the line. It was such an insignificant spread, but there was so much work put into it. It makes you think about the work that would go into this, and other parts of the process. I acquired it through a close friend of mine. He was getting another piece of photo art and he was taking a different direction with the collection and passed it on me as part of the trade. FP: How did your 2D collection evolve? TE: The early part of the collection was focused on the 21 backs and on ESB proofs. I was fortunate that a large amount of Star Wars items became available. From there it was piecing things together to make a set. John Wooten was letting go of a Leia Cromalin (Fett Offer) and that was the first one I was able to pick up. Proofs are the focus, but Cromalins are so aesthetically appealing and detailed that it really took it to another level. Then photo art was its own segment. I did everything I could when pieces became available. When it came to mock-ups, it was more about continuing to expand the collection once I had the majority of the 2D pieces. I was very religious as I purchased items and stuck with just those 21 characters. 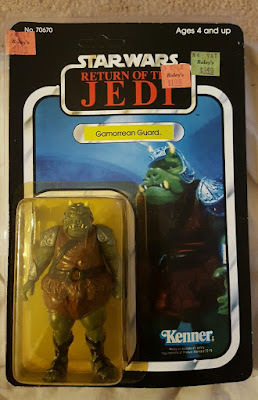 I would sell off items when I bought a collection, and really just stick to the 21 characters no matter how much I liked some of the other items. FP: What is your favorite character? 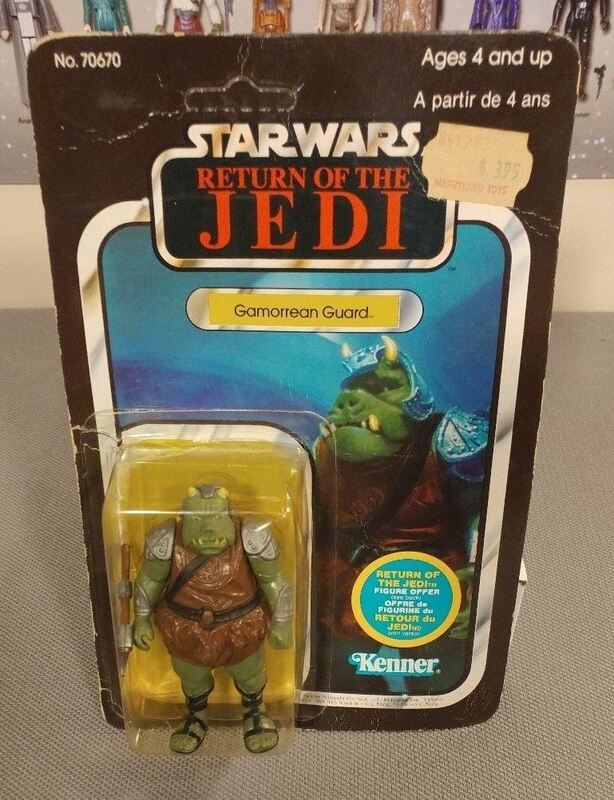 TE: Greedo has always been my favorite character. Partly because when I was getting into 2D, Gus had the photo art for Greedo and I locked into that -- this was a grail piece and something I aspired to find. 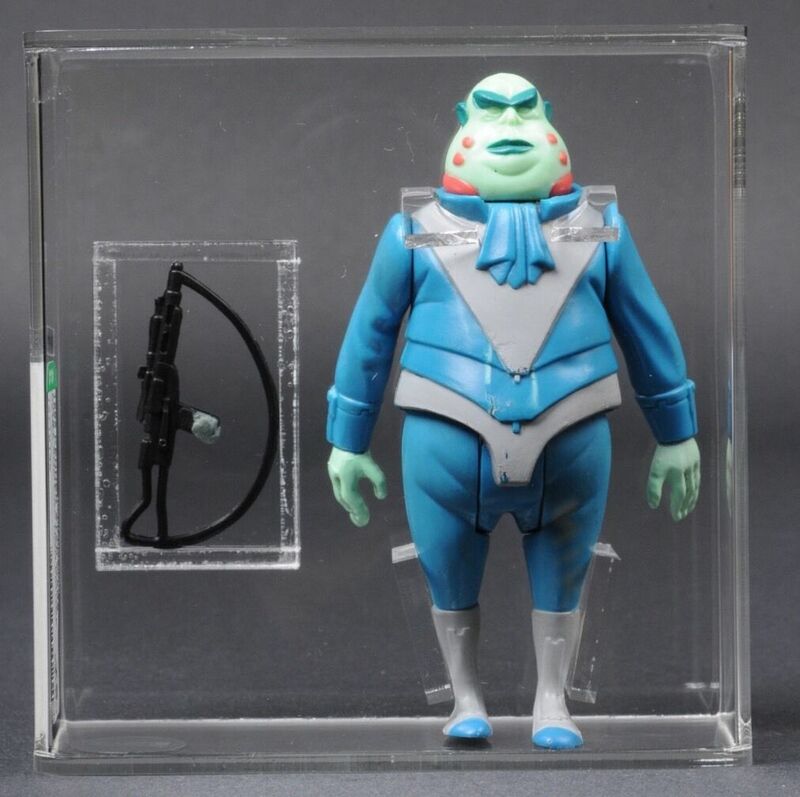 Personally he's my favorite character, he’s the best alien out there. One thing that’s unique is there are no Star Wars proofs for him. His debut proof is the 41 back Empire proof card. All of the mock-ups are QC examples; the ESB 21 is really neat as the purpose is to show the Bossk extension sticker on the back of the card. Another great piece is a multi-figure sheet that has 2-3 color proofs vs. the finished product, which originated from the Earth. I’ve been fortunate enough to add the 47 back proof to the collection as well last year. My favorite piece in the Greedo set is the POTF Cromalin. The colors just pop, there’s no offer; it’s a Cromalin so it’s unique unto itself. 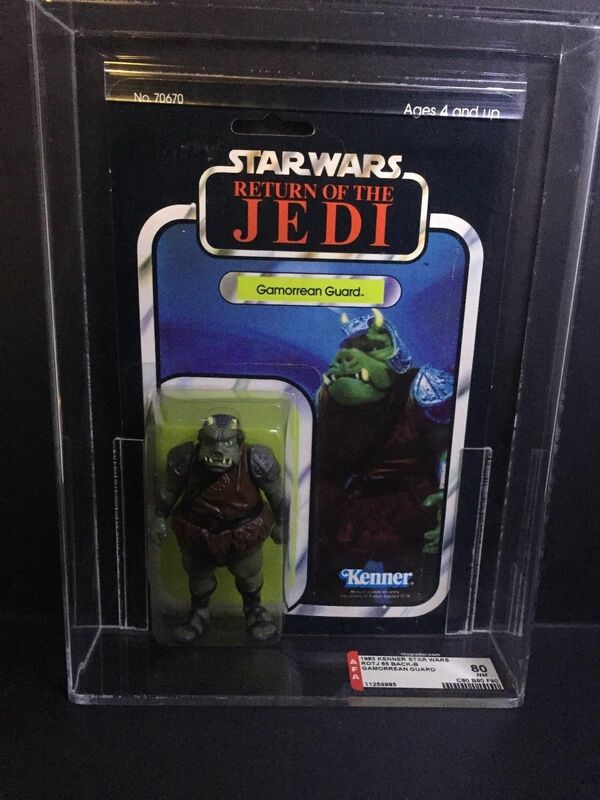 Second on the list would be the Fett Offer Cromalin. FP: What piece do you think took the most effort to acquire? TE: Star Wars Walrus Man Proof card. The collector changed his mind four times during a two month period; we shipped it to [Tom] Derby and left it with him. He would change his mind every other week on wanting to sell/keep it. It was the most back and forth of any of the pieces I ever bought. 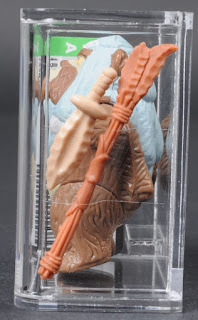 I had all the Walrus Man pieces at that time and I was really trying to close it up as it was the only one I needed to have the complete run of Walrus Man proofs and Cromalins. 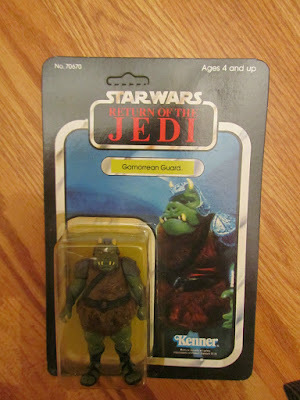 Plus, he’s another Cantina character and I have a bit of an affinity for these characters. FP: Some of the most interesting pieces for someone who has dealt with the Revenge of the Jedi line over the years are the Luke Skywalker X-Wing Pilot Revenge logo variations. Tell me about those pieces. TE: They were mock-ups of for the Revenge cardback logos, the shape and size specifically. They were mocked up on an offerless 31 back. Even though they were already doing 48 backs, they wanted to mock these up on offerless cardbacks. Some of these were pretty crazy -- lightning bolts and things like that -- just didn’t make sense given where the line had been. 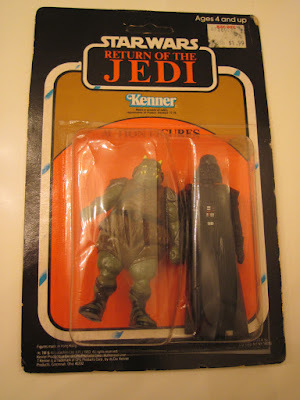 They also did this on Vader and Rebel Soldier cardbacks. FP: Tell me about the Star Wars and ESB sheets. TE: The 4-card Cromalin came out of Gus’s collection. 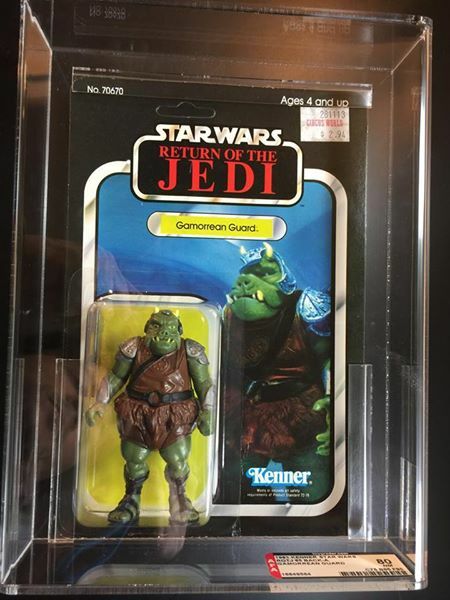 I got it around the same time he let go of the Greedo artwork. I was really surprised that I ended up getting it as he actually had it hanging above a bed in his home. It’s a really critical piece. There are a lot of mark ups that were done on the sheet, so it was early enough in the process that it wasn’t close to final. It still surprises me that this survived given there were so many key characters on this sheet. You’d think that it would be cut up along the way. It shows that Gus probably grabbed that as soon as it came out into the market. No other Cromalins, but there are some proof sheets. The ESB sheet was one of the few items that came out of the Earth that was a full color piece. Someone was trying to trade stuff back to Tom Derby for some really key ROTJ pieces: Bib Fortuna with a white cape and Squidhead with a black cape. Tom really helped me with a lot of my collection and offered that up to me. To my knowledge there’s only one other sheet that’s out there. At the time that it came up I was sitting on two 4-character Jedi sheets. I really didn’t want to let them go, but when this came up I thought it would satisfy the craving for a multi-figure sheet. Back in the day, a lot of people cut up the sheets just because they could cut it up, sell it to focus collectors , keep a few for yourself and still make some money off it vs. what the full sheet would command. Today it’s a different story, it’s flipped around completely. We'll pick up with Tim in a few weeks covering his 3D collection and the "lighting round."